In early 2014, I took up a Creativeworks London Researcher-in-Residence post with the Ragged School Museum in London’s East End. 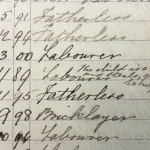 My project was straightforward: to transcribe the surviving admissions books for the Doctor Barnardo’s Copperfield Road Free School – the late nineteenth-century institution which forms the Museum’s basis, site and raison d’etre – and compile a report on their usefulness as historical sources. Erica Davies, the Museum’s director, had been aware of the registers for years, and itching for an opportunity to open them up to sustained historical enquiry. We decided that we wanted to reassert the importance of the Ragged School movement in the history of Victorian philanthropy: work on the phenomenon has been relatively sparse, and the Museum itself is the only surviving example open to the public. Eighteen months later, in October of this year, I found myself standing sweaty-palmed and trembling in front of a museum panel featuring those same registers, and some of the stories of the children whose names are in them, trying to explain to a slightly mystified-looking LondonLive TV reporter why what the registers can tell us about childhood and family poverty in the old East End – about poor healthcare, lack of welfare, voracious landlords, food poverty, economic precarity and unstable employment patterns – might matter in a present-day London in which one in four children grow up poor. I hadn’t expected that the registers I spent hours transcribing would ever see the light of day so publicly. But collaborations – good ones, anyway – have a tendency to send out unexpected shoots. When I started my residency, I was completing a PhD at Queen Mary University of London. Queen Mary and the Ragged School have a long history of working closely together: they are, after all, close neighbours in the East End, and share a common history in the movement for working class education. So when a team led by Alastair Owens from Queen Mary’s School of Geography put in a bid for a project to develop a new exhibit and portfolio of educational resources for the Museum, I jumped at the chance to add my own research and act as general factotum. Our project, which was eventually titled “Ragged Children: Mended Lives? : Childhood, Poverty and Philanthropy in Late Victorian London”, set out to explore the conditions under which children lived in the East End, and the various means by which philanthropists tried to ameliorate their lot through education, welfare, healthcare, and various kinds of moral improvement and social engineering. We assembled, in the end, a crack team of Queen Mary researchers. Alastair contributed his rich ongoing research, developed in collaboration with Tim Brown, on how late Victorian philanthropists took it upon themselves to emigrate thousands of poor children to Canada and the Dominions. Tim also collaborated with Oliver Gibson on developing materials which explore the complex relationship between poverty, public health policy and the Victorian ideal of ‘fresh air’ as something which could improve the health (and, implicitly, the morals) of the children of London’s poorest streets. I contributed my research on the Ragged School movement. Finally, Tessa Whitehouse, a lecturer from the School of English, contributed her innovative work on childhood, human rights and cultures of dissent – research which crucially reinstates, in an overall narrative which is often deeply troubling in its subject matter, the critical question of how children have been understood as political subjects and agents of their own destinies. 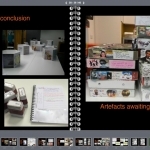 We worked hard on translating often complex academic research into accessible public-facing materials, on sourcing visual materials (many of them previously unseen) from various archives, and on negotiating the difficulties of academic timetables and the demands of national and local education curricula. We found that much of the projects’ real difficulty lay in boiling down huge and multifaceted narratives to a scant few hundred words of readable copy without effacing the ethical difficulty of much of what we were trying to convey. Subjects like child custody, care homes, and mass organised migration are, to put it mildly, subject to a certain amount of contestation, often cutting to the heart of the politics of human rights and human difference, social welfare, empire, and race. To honour such overwhelming and complex moral ambiguities while avoiding either glibness or mealy-mouthed hedging, and to pay qualified tribute to the work of philanthropists such as Barnardo without glossing over the problematic nature of much of what they did, stretched our interpretative skills to the limit. Along the way, our work grew with the help of extraordinary individuals and organisations. Barnardo’s gave us the run of their considerable archive, helping us find the materials we needed, follow up case histories, and reproduce their stunning visual materials. The Gentle Author, the mysterious pen behind Spitalfields Life, gave us free access to the works of the incomparable portraitist Horace Warner – a gesture of quite astonishing generosity which enriched our displays incalculably. Our designer, Isabel Ryan, turned a slew of copy and images into a comprehensible visual whole, teaching us by example how to communicate in the visual grammar of museum display. Archivists, historians, volunteers, and descendants of child emigrants gave us their time, energy and research with a spirit of commitment and engagement that gave us, as academics, the rare feeling that our work palpably mattered to people outside the academy. Finally, Creativeworks London and The Culture Capital Exchange (TCCE) encouraged us to hold our exhibit launch party as part of the Inside Out Festival. The opportunity to celebrate (and, more importantly, promote) what we’d made under the umbrella of a city-wide celebration of just such collaborative enterprises was too good to pass up. 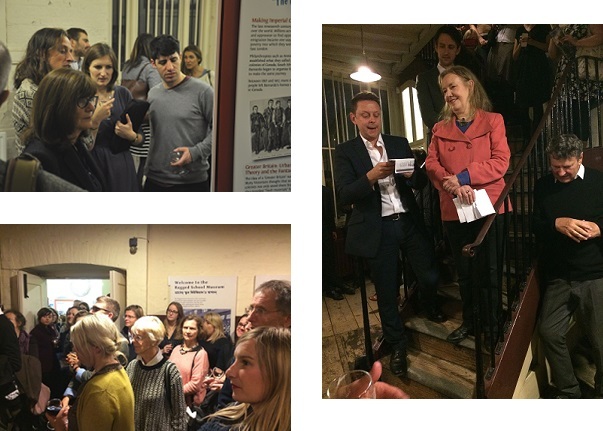 Combining Queen Mary and the Ragged School’s pre-existing PR resources and address books with the considerable promotional and networking heft of TCCE helped us reach all the audiences – museum people, arts mavens, press, academics and the general public – that we wanted to attract. We had the 12th Earl of Shaftesbury, whose ancestor the 6th Earl gazes austerely out of one of our panels as the founder of the Ragged School Union, in to open the exhibit; and we threw open the doors of the Museum – a stunning nineteenth-century warehouse building with a period Victorian classroom, and more staircases and hidden crannies than you could reasonably explore in an evening – to an adult audience who all too rarely make the journey to see this remarkable survivor of Victorian philanthropy. Which is where I came in, undergoing the traditional embarrassment of an early career academic’s first encounter with a TV camera, trying to justify an exhibit that can probably speak for its own relevance better than I can. Delivering such initiations into public engagement, however painful, may well be part of the success of a project like this. It’s hard to know in the end, though, whether we managed to do what we set out to. We won a Queen Mary Centre for Public Engagement ‘Interact’ award, which was nice; comments overheard in the museum, including an impassioned debate about the rights and wrongs of child emigration inspired by some of our panels, indicate that at least some of our material has hit home. 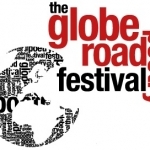 Perhaps the crucial measure of whether a collaboration like this one – between two institutions, near neighbours, who share origins and interests and goals, who have an incalculable amount to offer each other – is whether it continues into the future, generating new projects and commitments, attracting new funding, and becoming in some sense a relationship rather than a collaboration. I suppose we’ll see. 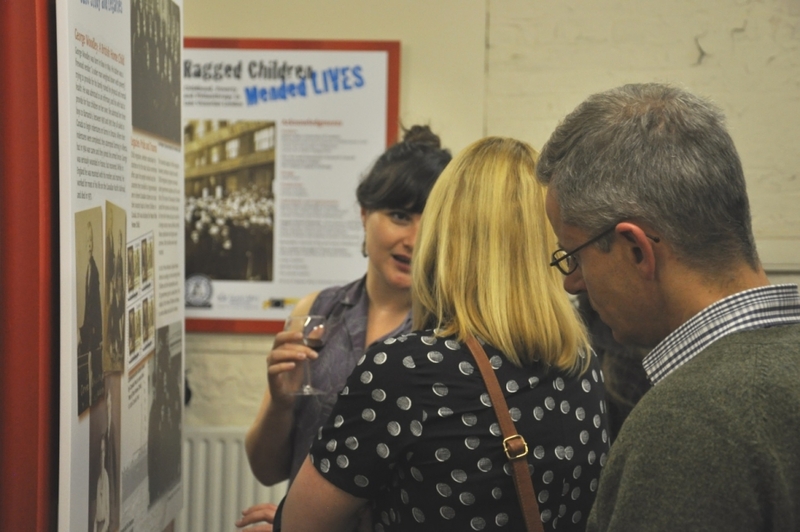 Images from Ragged Children, Mended Lives exhibit launch, Tuesday 20th October 2015.